As glorified typewriters, you can’t beat the battery life offered by the MacBook Air. 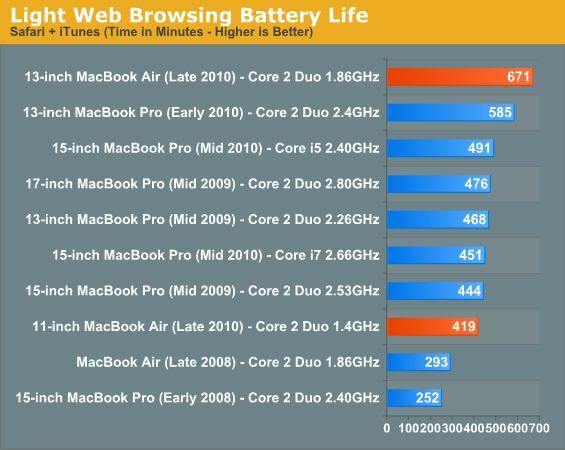 Light web browsing, document creation and music playback have minimal impact on the Air’s battery life. In fact, we actually beat Apple’s battery life claims in our light tests. The 11-inch Air delivers nearly 7 hours on a single charge and the 13-inch managed 11.2 hours. For a writer, you can’t do better than this. Apparently the addition of the Flash plugin is what really makes a difference. 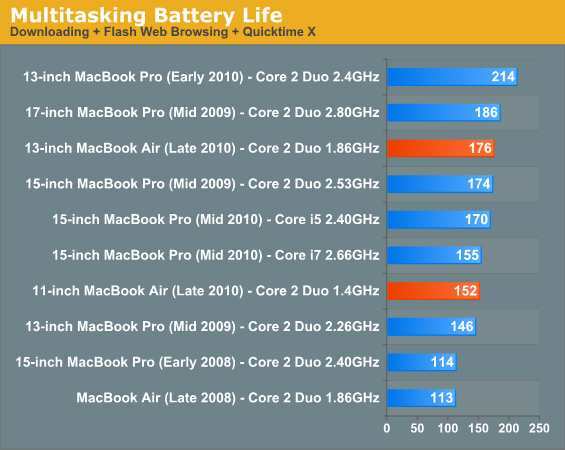 AnandTech then reviewed the new MacBook Air with Safari browsing around with Flash player enabled and running on a web page, and found battery life is reduced to 4 to 5 hours for the 11″ and 13″ models. No wonder Apple stopped shipping Flash with new Macs. Based on the above findings, here’s my suggestion: If you’re going to get a new 2010 MacBook Air 11″ or 13″ model, I would strongly recommend installing the latest version of Flash but then using something like ClickToFlash to prevent Flash from automatically loading, this should provide a generous boost in battery life since it lets you choose when Flash loads on a webpage. From reading various reviews and reports on battery life, it looks like Apple averages usage situations to arrive at the 5-7 hour measurement. The good news is that it’s a pretty accurate claim for the average user. The better news is that if you’re light with your battery and CPU usage, you can squeeze out much longer battery life. I like real-world battery tests and I think AnandTech does a pretty good job of capturing what you would expect in real world usage. You can read the full AnandTech review here. If you’re in the market, you can grab the new MacBook Air 11.6″ and MacBook Air 13″ from Amazon or the Apple Store. I have the 11.6″ model and it lasts much longer than the Asus netbook it replaced. I’m quite happy with it. This extension will automatically load html5 videos on youtube. And surprisingly, i found that all the youtube videos i watched (directly on youtube or tagged on a webpage) were all in html5. isn’t that just the risk of running more apps? try turning off ur wifi (and every other app ur running for that matter). i’m sure the battery will last a lot longer.. I get about 2 hour battery life playing world of warcraft. Does any1 know if that is right or should i get more battery life? Not certain how the tests were done but my “real world” tests on a 13″ MBA showed about 4.5 hours in OS X with four applications running (Safari, Excel, iTunes, Chrome) and a little over 5 hours in Windows 7 on the same machine with the same applications (note, reconfigured for solid state memory). I do not doubt you could limit what you are doing to get more than 7 hours, but I would not plan on seeing 11 hours of battery life unless you are not doing much web traffic and avoiding all CPU intensive tasks. installed Flash and boy was that a mistake on it’s own, immediately lost an hour of battery life on the web. Get Flashblocker and you get that time back. How long does the battery life last when running windows via bootcamp and doing programing for say android or ms in vis studio? My 11″ MBA battery has 60 cycles and about 96% health. It only lasts about 2 hours using MS Word, Excel, and Powerpoint, and that’s if I dim the screen and turn off the bluetooth and wifi. If I watch multiple streaming videos on Firefox, it only lasts like 45 minutes. I’m really disappointed. For all of you with short battery life, how many cycles do you have? Of blocking everything and boast around of having more battery life. So you Love watching adds over the internet! Good for you! My laptop a Macbook air 13″ only has 2hrs and by the end of the school day (6hrs) i have nothing left. All i do is do typical classroom activities like typing and researching, does anyone know why?